Decadent’s production "is full of verve and energy"
HAVING ENJOYED a sell-out run at last year’s Galway International Arts Festival, Andrew Flynn’s fine production of Pat McCabe’s The Dead School gets a welcome revival this week at the Town Hall. Whereas last year’s outing was a co-production between Galway Youth Theatre and Galway Community Theatre, this new run (featuring most of the same cast ) is under the banner of Flynn’s Decadent Theatre Company. Adapted from McCabe’s 1995 novel, and largely set in the 1970s, The Dead School centres on the clash between teachers Raphael Bell (Gerard Howard ) and Malachy Dudgeon (Jarlath Tivnan ). Rigidly conservative and emotionally repressed, Raphael adheres to a storybook Ireland of saints, scholars and heroic patriots. Malachy has scant regard for Raphael’s old school values and revels in the incoming tide of modernity, embodied by movies like Midnight Cowboy and the songs of Van Morrison. However he also proves utterly ill-suited to the profession of teacher and faced with Raphael’s reproaches, unruly pupils and angry parents Malachy soon starts to crumble. Raphael also begins to mentally unravel beneath ‘the shock of the new’ as his cherished ideals are undermined and discarded by a rapidly changing Ireland. While the feckless Malachy is one thorn in his side what tips him over the edge is the arrival of ‘bolshy feminist’ Ms Evans (Kate McCarthy ) who is elected the parent’s representative on the school board and proceeds to ride roughshod over all Raphael’s policies, such as vetoing a school outing to Kilmainham Jail in favour of a trip to Waterworld. McCabe does stretch audience credibility with Ms Evans’ ready admission – before TV cameras no less - of having had an abortion. In the Ireland of 1975 such a confession would surely have stymied any chance of obtaining a position of influence on a school board. One could also argue that the plot is over-egged by having both the principal characters enduring parallel mental collapses. Against that, if Raphael and Malachy are taken as symbols of their times then the play suggests that the trendy modernists are doomed to meet the same fates as the olde-worlde fuddy duddies unless they achieve a healthier psychic balance in terms of their world outlook and relationships. 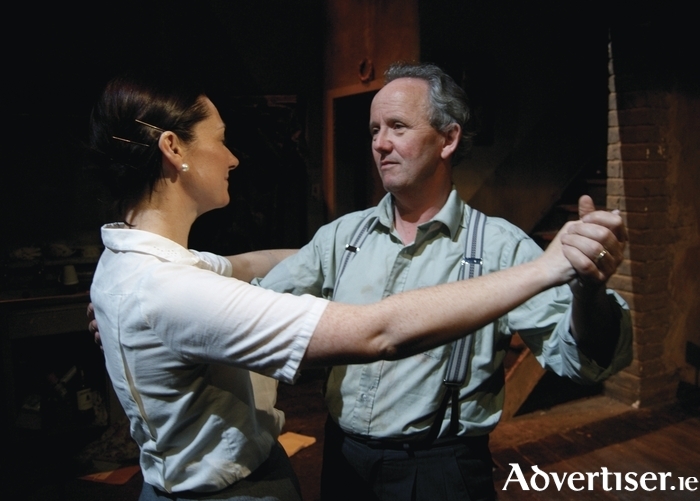 Certainly, Malachy and Raphael are alike in their emotionally stunted relationships with the women in their lives, in Raphael’s case his wife Nessa (Patricia Bohan on the night I saw the play – the role is being shared with Kate Murray ) and in Malachy’s his girlfriend Marion (Eilish McCarthy ). Raphael ends up barking commands at Nessa as if he was just another pupil while Malachy lashes out in jealous rages at Marion which ultimately drives her away. Both actresses give sympathetic, touching portrayals of their sorely put-upon characters who display the kind of humanity that their vexed and vexing partners could benefit from. Decadent’s production of The Dead School is full of verve and energy as Flynn makes the most of his large cast. Gerard Howard and Jarlath Tivnan are terrific in the lead roles and they receive sterling support from the rest of the cast (including Gerry Ferguson as the kind-hearted but weak-willed priest Fr Stokes ). Carl Kennedy contributes a great sound design and the use of music is a major factor in the show. The Dead School continues at the Town Hall until Saturday night and then goes on tour.